Hello! It's Sunday, it's Five Take time again. I have had a major busy weekend which I'll post about later, but for now lets talk Five Take! So a quick heads up for new readers - myself a 4 other gorgeous bloggers take a different theme, item, trend etc each week and do our own "take" on it. This week we're talking Midi Skirts. I quite like the midi trend. I'm not a huge gam of my knees, but think my ankles are pretty rocking, so midi suits me just fine! I have a few midi tube skirts that I adore but I haven't really tried a flowing style before. The skirt I chose for this weeks challenge was one of my many eBay acquisitions, it's originally George at Asda (quite some time ago by the look of the label) I'm complete sucker for stripes and I wanted to add a pleased skirt to my wardrobe so this fitted the bill perfectly. What's your take on the Midi Skirt? Have you embraced it, or is it just not your thing? I love a midi skirt! The simplicity of this outfit is great. Oooh, I LOVE a good midi skirt! They're a great length for just about everything, and I don't worry about exposing too much in them. 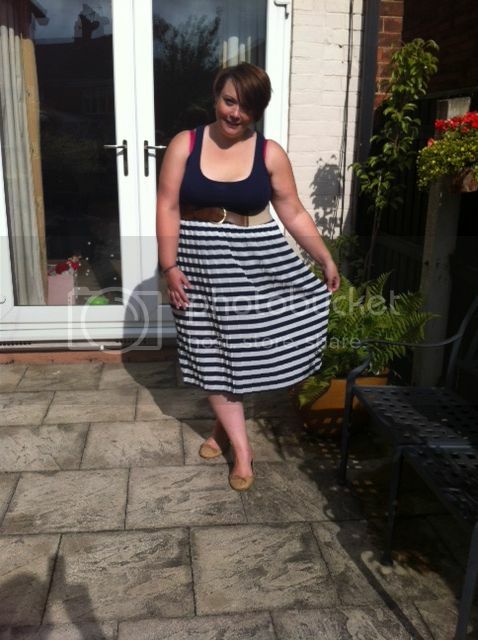 :) You look amazing as always, and I'm totally jealous of your pleated/striped version! It's adorable!